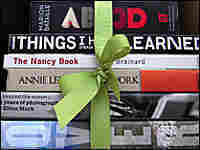 The Big Pictures: Best Gift Books 2008 The season of giving makes us think big, and that means picture books — from coffee-table extravaganzas to smaller stuff that's big on surprise and ambition. Dozens of amazing and illuminating books have been released throughout 2008 that could (and should, in these tough economic times) be contenders on your holiday shopping list. But there's something about the season of giving that makes us think big. And that means picture books, from coffee-table extravaganzas to the small stuff that's big on ambition. Finding the perfect gift usually is the hardest part, but with these books, the delivery may pose a challenge. A few of the gorgeous tomes below tip into the 20-pound range, so to give you a sense of what you might be lugging and/or mailing, we've included the physical attributes of each title. Whether your intent to delight tends toward the spectacular or the exquisite, each of these gems is guaranteed to dazzle. 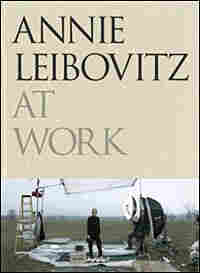 It shouldn't come as a surprise that a peerless aesthete like Annie Leibovitz would demonstrate extraordinary good taste in putting together this exploration of her working process. But it does. Picture books, traditionally, are big. This one passes up the opportunity to grandstand and instead goes small and texty and smart. 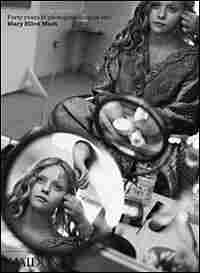 Oh, the scenes Mary Ellen Mark has seen. Imagine having been the set photographer for this trio of raucous classics: Apocalypse Now, Carnal Knowledge, Fellini Satyricon. For every thrilling and provocative picture here — of Belushi, Coppola, Depp, Streep, Hoffman, Brando and on and on — Mark probably has a hundred more in her files. As her images make clear, movie sets are often peculiar (One Flew Over the Cuckoo's Nest) and surreal (Tim Burton's Planet of the Apes). Accompanying texts by the likes of Mike Nichols, Helen Mirren and screenwriter Robert Towne reinforce Mark's visual thesis: Sometimes the best scenes are the ones not written. 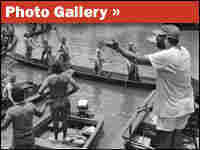 It's easy to see why the great photographer liberated certain sitters in this collection from the rigor of his trademark format. The energy of so many of the artists he adored could barely be contained by a stage or a screen, let alone a plain white background and black frame. 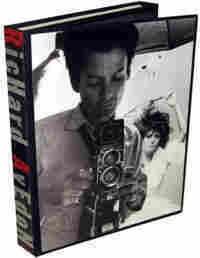 Handfuls of images in the aptly named Performance have been scattered across essential Avedon monographs of the past. But gathered here and paired with hundreds of other indelible pictures, the cumulative electricity and force of Capote, Streisand, Nureyev, Garland, Hepburn (both), Monroe, Grant, Bardot, etc., is positively overwhelming. Even Bill Keller, the paper's managing editor, says making up the front page is an imperfect science. But on Nov. 5, the New York Times got its top headline spectacularly right: "Obama!" Enough said. In this fascinating monster of a book, more than 150 years of history is on display. All the great events are here in 24-point type: the Lindbergh crossing, the sinking of the Lusitania, the JFK assassination, Sept. 11, even Custer's Last Stand. 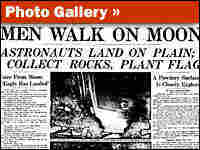 The book itself contains large-format reprints of hundreds of such front pages. 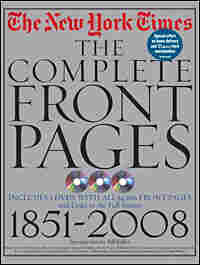 The three accompanying DVD-ROMs present the other 54,000 or so lead pages published since the Gray Lady's launch in 1851. Personal favorite banner headline, from Oct. 15, 1912: MANIAC IN MILWAUKEE SHOOTS COL. ROOSEVELT; HE IGNORES WOUND, SPEAKS AN HOUR, GOES TO HOSPITAL. At a chunky 574 pages, this is a slender book only by comparison to the Complete Front Pages. 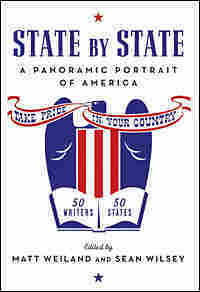 But State By State — a compilation of 50 thoughtful, entertaining and surprising essays by an all-star cast of hipster contemporary scribes — shares Front Pages' ambition, journalistic mission and sparkling execution. Need a rowdy sophisticate to rhapsodize about Joisey? Get Anthony Bourdain. Who could make sense of expansive Montana? Why not the squeaky-voiced Sarah Vowell. Among others doing their patriot duty: Dave Eggers (IL), Jonathan Franzen (NY), Jhumpa Lahiri (RI). Says Ha Jin about his life in Georgia: It "made me turn to the Bible." Can You Guess What Movie This Czech Poster Promotes? 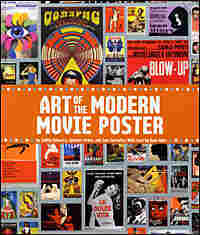 For a medium universally identified with Hollywood, cinema has never been so magnificently promoted in poster form than in countries throughout Europe and Asia, where the tradition of painting, a passionate use of color and a flair for the dramatic have inspired decades of staggeringly great movie art. Page after page of this stunning work of visual scholarship will mesmerize and, in many cases, make you rethink the power and meaning of the movies you most love — even if the Polish poster for The Godfather reads Ojciec Chrizestny! This tour de force should come with a warning label: Designers Of Faint Heart Or Shakey Confidence Shall Not Enter. But if you don't, you'll be denied a visual experience and a display of intellectual and graphic precocity so transcendently weird, it will make you giddy. 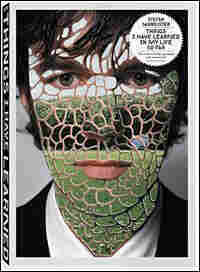 The book's many amazing moving parts (15 individual booklets are included, each devoted to one of Sagmeister's sloganlike "life lessons") can't be given justice here. But the 46-year-old Austrian heir-apparent to contemporary design god Tibor Kalman has stamped his face on the cover — and his genius on every page. There may be a better way to teach a kid the alphabet but certainly not a more goofily entertaining one. The epitome of an elegantly designed but simple-as-ABC pop-up book, ABC3D starts calling out to you as it sits on your little one's nightstand. 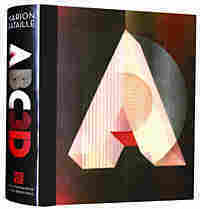 Its 3-D cover literally winks — "A," "B," "C," "D" — as you walk by. 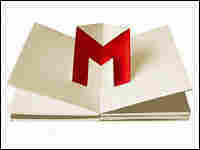 Flip it open and, page by page, the alphabet rises out of the fold in one ingenious maneuver after another. Not only will your child learn the alphabet, but this book may also turn him or her into a physicist — or pre-K's most deft origami expert. 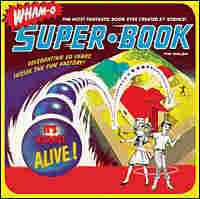 It takes all kinds, but, really, what could prepare any mind for a life inside the Wham-O toy factory? It helps if your name is "Spud" Melin, one of the many nerd entrepreneurs who, over the decades since 1948, have stocked toy chests around the world with such inimitably strange playtime obsessions as the SuperBall, Silly String, the Water Weenie and the Wham-O Air Blaster. 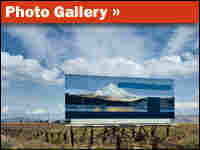 Tim Walsh's picture-heavy history of the California-based (where else?) company will provide a nostalgic kick for Mom and Dad, an object lesson in geek enterprise, and, for Junior, the seeds of the next million-dollar idea: Hula Hoop, The Video Game! It's a time of renewed enthusiasm in our country, perhaps like it was in ... 1973? Yes, the price is steep for this superb monograph. But for a collector with deep pockets and a deeper admiration for the master shooter that Stephen Shore is, it's worth every penny. An homage to photographer Robert Frank's seminal road journal The Americans (1959), Shore's book intricately chronicles Shore's own meandering monthlong trek in 1973 across a then far quainter USA. 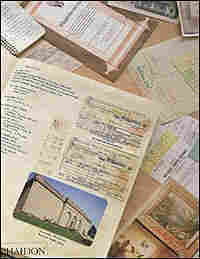 The accumulated images of his motel and restaurant receipts and of the churches and buildings and crossroads that caught Shore's inimitable eye — plus the scrawled notations of every meal and mile he logged — add up to an idiosyncratic time capsule and the most bizarre of travelogue mysteries. 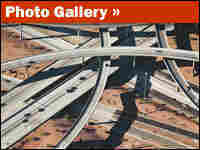 There's a lulling and seductive beauty to Alex MacLean's breathtaking aerial photographs of America. Even from the unsteady vantage point of a single-prop plane, MacLean's eye manages to find and capture entrancing geographic patterns and colors. It's only on closer scrutiny that you see the scars and obscene clutter of parking lots and power plants on our once pristine landscape. 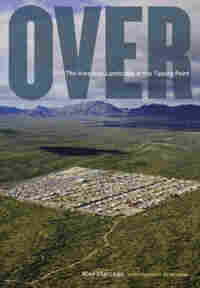 But MacLean's book is much more than a facile visual indictment of urban sprawl and ecological neglect. It's an extremely thoughtful, well-organized and researched contemplation of where we might be headed — with or without all of those dazzlingly circular superhighways. Conceptually and literally, one architecture book outweighs all the rest this year: 1,037 buildings; 653 architects; 89 countries; 800 pages; 20 pounds — the largest book I've ever seen, period. 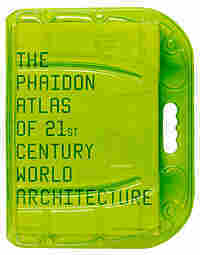 It requires its own plastic carrying case, a transparent lime-green thing that is a design wonder in itself. But spread the book open, and you'll tumble into a color future-world of architectural ideas, global cityscapes, angular abodes, envelope-pushing stadiums, high-tech lakeside bathhouses and bottomless textural detail. The spirited folks at Andrews McMeel have a thing for the funnies. Their past stabs at comic collections have included the meaty and exemplary The Complete Calvin and Hobbes (2005) and The Complete Far Side (2003). 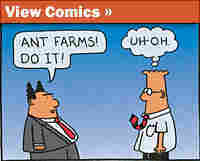 Actually, an exasperated white-color guy like Dilbert would appreciate McMeel's corporate zeal and dedication to quality — nearly 2,000 of Adams' strips are immaculately reproduced here, with running commentary from Adams himself. 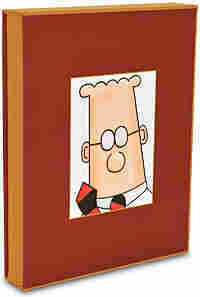 The artist and his sparely-drawn strip have taken knocks over the years, but Dilbert's piercing take on corporate life far outdates revered parodies like The Office and Office Space, and some whiny critic wouldn't be the first dolt Dilbert encountered in his long, long career. While we're on the subject of comics, this year saw the release of at least a dozen stellar compilations and reissues. Among them, The Best American Comics 2008 (edited by Lynda Barry, Houghton Mifflin, list price: $22.00); Jules Feiffer's Explainers: The Complete Village Voice Strips (1956-1966) (Fantagraphics, list price: $28.95); and the vibrant An Anthology of Graphic Fiction, Cartoons & True Stories (edited by Ivan Brunetti, Yale University Press, list price: $28.00). 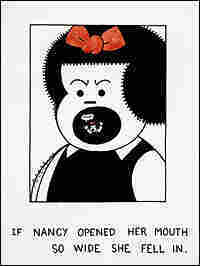 Despite its title, The Nancy Book is not kid's stuff — not only because it includes a dozen sexually explicit cartoon images, but also because it resonates as fine art, not funny-pages fodder. 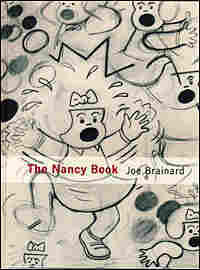 The late New York artist Joe Brainard (1942-94) took his childhood fixation with Ernie Bushmiller's precocious and precisely drawn cartoon character Nancy and, through the 1960s and into the '70s, worked it into a series of small-scale drawings and collages that dropped the 8-year-old girl into the worlds of, among other things, classical and modern art. Here's Nancy as Mona Lisa, or trapped in a Mondrian grid; there she is, her head superimposed on the body of then 18-month-old surrealist pioneer Andre Breton. 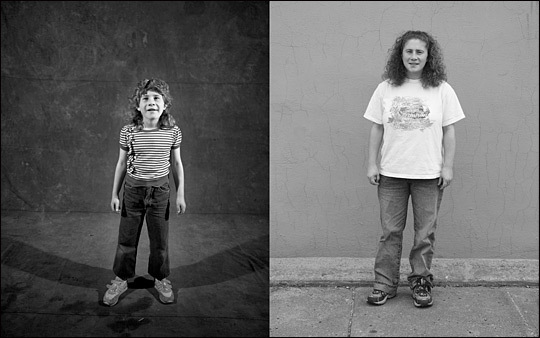 Mary Ann (Becicka) Storck, in 1984 and 2005. "I'm a planet fanatic. I feel close to God when I'm out walking. 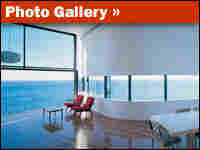 It makes me feel at peace." 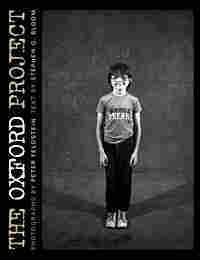 You wouldn't want to try this in, say, New York City, but when Peter Feldstein set out, in 1984, to snap portraits of every single person in his hometown of Oxford, Iowa — population 676 — it seemed like a manageable idea. It morphed into a great one more than two decades later, when Feldstein re-shot those same friends and neighbors (or as many of them as he could find) and happened onto a case study in human evolution and perseverance. 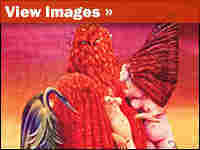 Young girls in 1984 are now grown women; grown men in '84 have now grown warier or wiser (and, in most cases, heavier). Their then-and-now portraits, shown side-by-side, tell one powerful story; in accompanying texts, their beautiful testimonials to time and life and people tell another. 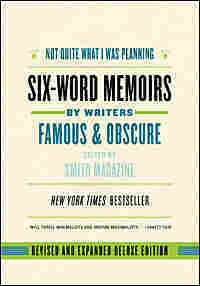 This expanded and newly released edition of the early-2008 New York Times bestseller builds on the gleeful and compulsive readability of the original. The concept, inspired by Hemingway, is simple: Sum up your life in six words. Here's what The Know-It-All author A.J. Jacobs came up with: "Born bald. Grew hair. Bald again." Mary Roach, author of Stiff, Spook and Bonk: "Cadavers played an unexpectedly large part." 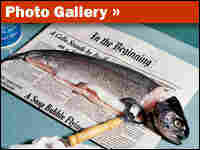 Iron chef Mario Batali: "Brought it to a boil, often." You don't have to be famous to be witty. 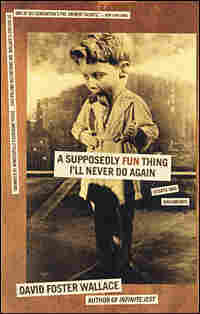 Sublime lines from the book's "obscure" contributors include: "The freaks, they always find me"; "Loved Natalie, love Jacqueline, married Debbie"; "Thought long and hard, got migraine"; "No, you are in MY way." Let me give it a try: "Wrote pricey gift guide. Advice: Amazon!" Despite a staggering intellect and talent that set him apart, the writer David Foster Wallace was by all accounts a determinedly decent and humble everyman. His death this year, at the unbearably young age of 46, was not just an impossible loss to his family and friends, but also to the literary world. For a moment, at least, it felt like the extinguishing of thought itself, and of promise and art and passionate curiosity. For some of us, the only way to salve the sadness was to bathe in Wallace's exuberant writing. Any of his published works would do, but this essential collection of his journalistic pieces — now more than 10 years in print — is particularly alive with laughter and fearless invention. The man burned brightly, and, as gifts go, he gave generously. This season or any other, you couldn't do better than to pass along his flame.